Strathmore 400 Series Gray Scale Pads contain 15 sheets of 80lb. textured paper. The paper comes in 3 sheets of white, black, and three grays that make this pad perfect for value studies using charcoal, pastel, chalk and sketching sticks. The paper is also suitable for graphite pencil, colored pencil, oil pastel and mixed media applications. Your order is shipped from Art & Frame of Sarasota in Sarasota, Florida 34236. What will my shipping cost be? When you place items you wish to purchase in the shopping cart the shipping costs will be calculated on the Shopping Cart page. You can also click the ? next to "Shipping" in the Shopping Cart and enter your state and zip code and the lowest cost shipping option wil be calculated. You will not need to enter your credit card number to get a shipping quote. Please call 800-393-4278 or email orders@in2art.com if you have any questions or concerns. in2art reserves the right to change the mode of shipping when necessary to ensure your package arrives in the best condition. Free Shipping Policy: If your order qualifies for free shipping and one or more of the products are out of stock your order will be shipped once it is complete. If you would like to have a partial order shipped, you will be responsible for the cost of the second shipment. Exceptions will be made at the discretion of in2art.com. Please allow 1 to 5 business days for processing in addition to the shipping time chosen. Please call 800-393-4278 or email us at orders@in2art.com with any special requirements you may have. Once your order has shipped you should receive tracking information (if you have provided an accurate email address) by the end of the day. Expedited Shipping: If you choose expedited shipping you must call for availability to ensure that your order will be shipped that business day and your order must be received by 2pm EST. There may be instances in which an item will be out of stock. We will contact you immediately if this occurs. Depending upon the order, we will refund you for the out of stock item or hold the order until it can be shipped complete. If you have any questions about how your order will be shipped or if you would like your order handled differently please give us a call at 800-393-4278 or email the in2art.com team at orders@in2art.com. 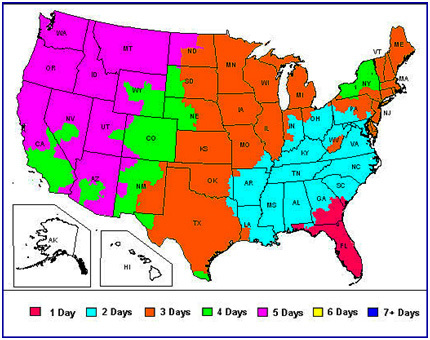 See transit times below for FedEx Home Delivery. These items may require an additional charge due to size or weight (examples: large canvas and boards, tables, easel, gallons of paint and other heavy items). There may be an additional shipping fee for those items. This fee will be included in your shipping costs. These items are labeled "Oversized". What does "*Ground Shipping Only*" mean? This message denotes items that are hazardous or flammable and cannot be shipped via any type of air shipment, including Priority Mail. Orders that include these items will be shipped via UPS Ground, regardless of the shipping option chosen by the customer. These items are labeled "! *Ground Shipping Only*!". In2art.com ships to most international destinations via insured international priority mail, first class mail and FedEx. Please email us at orders@in2art.com or call us at 941-366-2301 with your list of desired items as well as your shipping destination for a shipping quote. Shipping fees for international orders are all based on the size and weight of your order and shipping destination. We will respond in 24 hours with the USPS shipping cost, (FedEx if requested) as well as payment options. How do I pay for my International Shipment? Please Note: Many countries charge a Value Added Tax (VAT) or a Goods and Services Tax (GST) on goods consumed or received in that country. By the act of ordering a product for overseas delivery, you agree to pay any duties, customs, taxes or fees required by your government or the shipper. In2art.com is not responsible for any of these additional charges. PayPal: If you choose this option, email us and we will give you our account number so you can submit payment. When you have completed payment with PayPal email in2art.com and inform us your transaction is complete and your correct shipping address. Wire Transfer: $25.00 Wire Transfer fee is required: Plus shipping. We will send you the necessary information for the wire transfer once we have completed the detail cost of your order. Do you ship to APO of FPOs? Yes, we are happy to ship to our servicemen and women. We ship to all military addresses using US Priority Mail. Contact at us at orders@in2art.com or call 800-393-4278 or 941-366-2301 and we will calculate the shipping costs or place your order directly through our website. If you would like to return a product please contact us for the mailing address and for your Return Authorization No. RA#). This number must be boldly displayed on the outside of the box. Please note: If a package has been refused and sent back to us, it is considered a return and may be subject to a standard shipping deduction. In such cases, we will attempt to contact the buyer for up to three business days following our receipt of the package. If the buyer cannot be reached within that time, we will issue a refund of the purchase price minus the standard shipping and a 15% restocking fee if applicable. In2art.com is the sole owner of the information collected on this site. We do not sell, share or rent this information to others in ways different from what is disclosed in this statement. We request information on your order form including contact, billing, shipping and verification information. This information is used for your order, billing and verification purposes only! If we have difficulty processing an order, the contact information is used to get in touch with the customer. In2art.com takes every precaution to protect our users’ information against loss, misuse or alteration of your user information. When users submit sensitive information via our website, the information is protected both online and off-line. All information is fully protected by SSL encryption technology. Credit card information is not retained once you process your transaction. We may, from time to time, send you information about our products, details of promotions and special offers via email. We give you the option not to be contacted by email regarding special product information or offers. Uncheck the box on our Checkout Page to receive emails and promotions or call us at 800-393-4278. Or, if you are currently receiving emails and would no longer like to receive emails scroll to the bottom of the email and click Safe Unsubscribe. Please note that you will still receive customer service related communications about your transactions from us.